With the increasing numbers of submissions to Raging Chicken Press, we’ve been thinking of expanding our publishing schedule from once a month to twice a month. If you’ve been following the going-ons in our little corner of activist media, you know that I’ve been batting around the idea of doing an “Early Edition” at the beginning of each month. Well, here’s our first crack at it. As you’ll see, this “Early Edition” has fewer contributions, but if we continue to get the kind of submissions we’ve been getting, we might just try publishing full editions twice a month. Frankly, the only thing that is holding us back from doing so at this point is the work load. 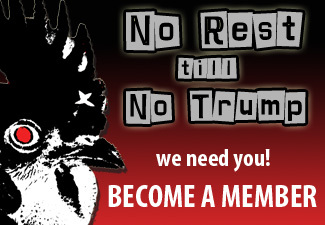 And, yes, that sentence is a segue to a call for aspiring activist journalists, videographers, editors, podcasters, and social network enthusiasts to c’mon out and join us Raging Chickens. At this point, we’re all volunteers and we can use whatever skills you bring to the table. Interested? Drop me a line at ragingchickenpress@gmail.com. 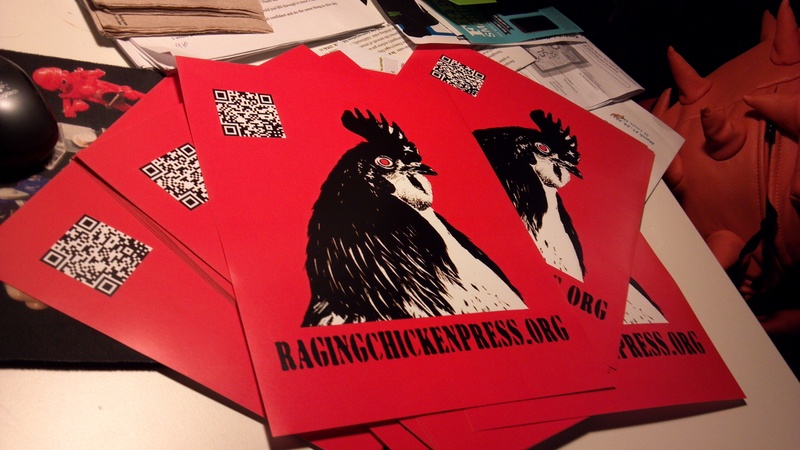 If you’re still thinking about contributing to the May issue of Raging Chicken Press, remember the deadline for submissions is this Thursday, May 10th. It looks like we’re in good shape to go ahead and publish the May issue on the 15th. There are 52 days left in this round of our fundraising drive. The good news is that as of this writing we’ve raised $515.00! A little side-note to all of you who contributed so far, you’re thank you gifts will be on their way very soon. 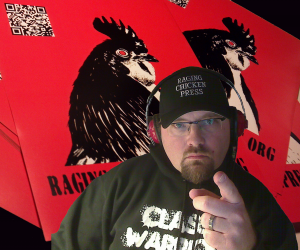 After several unexpected setbacks, I got a package this week with stickers, mugs, t-shirts, and more to send out to all of you awesome Raging Chicken supporters. The less good news is that we’ve only raised about 2% of our goal. It’s been a learning experience for sure. I could not be happier with the amazing work we’ve been able to do with next to no resources (other than those that come out of my pocket). However, we’re growing fast and are hitting the limits of what we can afford to do. For example, one of our writers is doing some pretty amazing investigative research on fracking out in Western Pennsylvania. He’s been able to do some great work over the phone and email, but we’d like to be able to send him out there for a few days with a video camera and recorder to talk to the affected families. Imagine if Raging Chicken Press had the resources to cover some of the costs of this kind of investigative research. Pretty cool. My goal from the beginning of this project was to appeal first to the progressive community directly for support. The idea was that the more that this project is funded by individual members of the progressive community, the more we can ensure it will always be for the progressive community in a very concrete way. We recognize that not every progressive out there has the time or ability do the kind of work we are doing here. 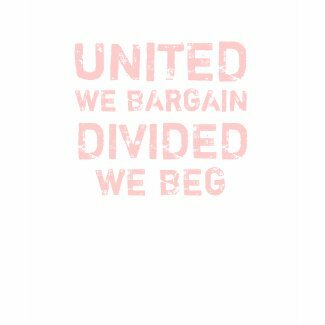 But we can build a networked community of contributors and donors to help strengthen our movements. It’s clear that I’m going to have to rethink how to best fund this project for the long haul. I am wide open for ideas and help! Let me know if you’ve got some ideas for raising funds. I’ve been looking at some grants, starting a membership program, and approaching some regional, progressive organizations directly. We’ll see what comes of it all. Another very easy AND FREE way you can help support what we do is to use the links on the right-hand sidebar to do all your Amazon.com, fair-trade coffee, and book shopping. Use the search boxes or click through and shop as your normally would. You will have the same experience as if you went to the sites directly. The only difference is that part of your purchase, generally 4-8%, will go directly to Raging Chicken Press. Even better, bookmark the links and use that bookmark every time you shop. We’re certainly convinced. So, next time you’re thinking about ordering a book online, picking up a good read for a gift, ordering textbooks for school, or downloading an eBook (yes, Indies do eBooks too! ), consider going Indie and going local. 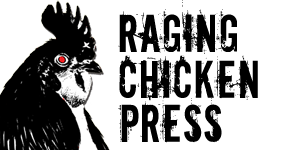 And, to ge the most bang for your buck, use our Shop Indie Bookstores link and support Raging Chicken Press while you support your local community. I think you’re going to really dig the full May issue. We’ve got some great interviews and articles that remind us that the month of May begins with May Day–International Workers’ Day. The Occupy Movement organized actions around the country, which seemed to be the opening shots of an American Summer. We plan on being there as actions over the summer heat up. Let us know what you will be doing to fight back.